Hi, I just tried to install the 2.48 version and got the following error message during installation. What I have tried: Uninstalled older version, cleaned leftover registry keys, restarted PC, re-installed with all apps and folders closed. It would always give me the same message. Version 2.47 installs without issues. if you press on Ignore? 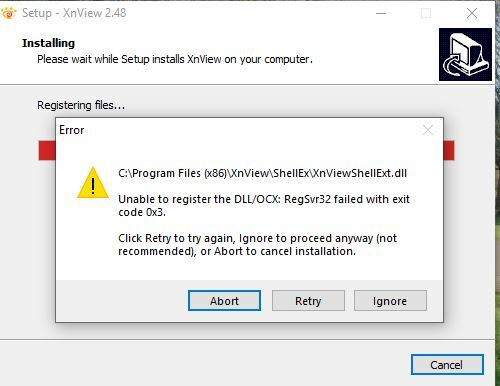 What will happen with XnViewShellExt.dll? I have tried that. Same message. Doesn't happen with previous version. I can't reproduce on Windows 10 x64. Do you use XnViewShellEx? Do you have installed before the standalone XnShellEx package? I didn't have it when all these happened, but because of this issue, I looked it up and installed separately the x64 to try it. But as I said all the issues where present before separately installing it. could you try to re-download the 2.48 setup, and install it? Hi and sorry for the late response (I have been really busy). Although, I had already tried downloading the installer again and hadn't worked, this time it worked and the installation completed successfully. I don't know if the installer was changed or if by installing XnViewShellEx separately helped. Thanks a lot for your help.